Creative Missions: Baltimore | Tim Gaskins | Communicator. Storyteller. Designer. As a church communicator, it’s easy to fall into the mindset that everything you do is about making your church the best, the largest, and the newest – except we forget the gospel and what God is doing in churches around the world along the way. This year, I got to experience more than just the labor and fruits of the week in Baltimore. I had the opportunity to be there in February for a weekend, joining the leaders to meet with pastors on their second vision trip to the city. Some of these pastors were hearing about Creative Missions for the first time, other than an introduction email. Time and time again we heard things like, “You’ve come at the perfect time”, affirming that this was where Creative Missions was supposed to be in 2014. I was able to see God at work from February to May. I heard from a pastor in February, who was without a logo or web solution, but with God-given dreams, and then saw him raise his hands up with tears streaming down his face in May, calling our team “arm-lifters” just as Aaron and Hur were to Moses. That pastor and his staff are now re-energized to proclaim the gospel in their section of Federal Hill, in the heart of Baltimore.I was on a team with four talented creatives working with two churches for the week in May. 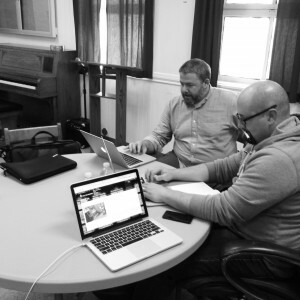 I primarily worked on a new website for Jesus Our Redeemer, a church plant also in the Federal Hill neighborhood pastored by Brad O’Brien. He felt God’s call to Baltimore and was sent out from his church in North Carolina last Summer. God’s blessed him as a leader with a strategic mind and many ideas. Our team got to come in and make those ideas happen! Early in the week he told us that one issue on their current website would take him an entire day to figure out. We’ve freed him up to preach and lead his church, while being just an email away if he has an issue with his new website. All in all, 30 creatives created solutions to help 20 churches and ministries communicate the gospel to Baltimore. Churches in Alaska are still using new logos, websites, and welcome videos to preach the gospel to Anchorage. Pray for Creative Missions as we follow where God is moving in 2015. Thank you to anyone who has supported me financially, offered encouragement, or prayed for me and the teams on both trips. I thank God for you. Thank you to my boss, John Boyle, and the leadership of Calvary for empowering me to go work on projects at other churches without taking vacation time. I’m so thankful to be on staff at a church that teaches and lives out the gospel in all ways. Calvary truly believes the name is Jesus and not Calvary Bible Church.